It's that time again, mein drinkers -- Oktoberfest is well upon us! 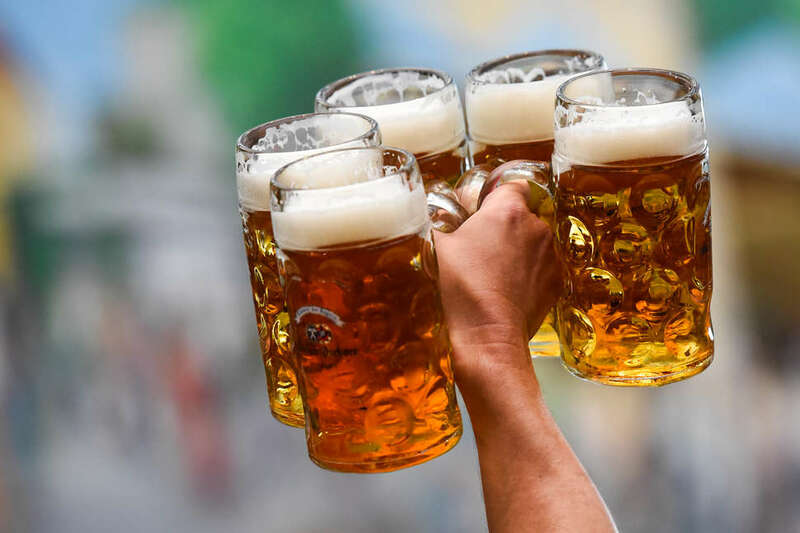 And while dumb, pesky stuff like jobs and empty bank accounts might prevent you from skipping over to Munich this year, rest assured you can still celebrate stateside at any one of these 14 lager-laden havens of German hospitality in the US. Opened by a German immigrant and Civil War vet in 1866, Austin's go-to biergarten is also the oldest operating business in the great state of Texas -- but don't worry, this ain't just your pawpaw's saloon. There's plenty of cold German lagers and weizens -- plus American craft selections from the likes of Live Oak and 512 -- on tap to combat those muggy nights and hungry drinkers choose from an über-Texas mix of stuff like BBQ nachos and chicken-fried steak, as well as a smattering of Bavarian staples such as bratwurst, giant pretzels, and schnitzel. A healthy mix of students, locals, and old-timers roam around the sprawling, Christmas light-strewn indoor-outdoor space or take shelter in the warm, wood-paneled interior, every one of them ready to drop the pint and bust out a mean two-step once that live music gets pumping. Is this monolithic, block-long German restaurant and beer hall corny? Well, yes… that should be expected from a gigantic Bavarian-style building plopped in the middle of a German-themed town where a 365-days-a-year Christmas store is the star attraction. And while the all-you-can-eat fried chicken is only the second best in the city, it's still pretty great. The resort/beer hall is an icon, where buxom servers in traditional garb hoist armfuls of steins and polka never stops. In the summer the outdoor action is like a never-ending Oktoberfest: you can put down German beers to a soundtrack of live music, then take to the dance floor to burn it all off. Or just spill beer everywhere. It's like being in Germany, but with Midwestern accents. With its trendier-than-thou boutique shops and $15 mixologist-engineered cocktails, Hayes Valley might not seem like the ideal neighborhood for a chilled-out, no-frills German biergarten, but somehow this charming little corner of the world manages to fit right in. Maybe it's Biergarten's excellent 25-draft-long tap list, dotted with West Coast favorites like Green Flash and Stone as well as European classics like Spaten and Reissdorf, each available by the liter and sold out of an effortlessly cool refashioned shipping container. Or maybe it's the unpretentious, cozy, open-air ambience, softly lit by crisscrossing lines of lightbulbs glowing overhead. 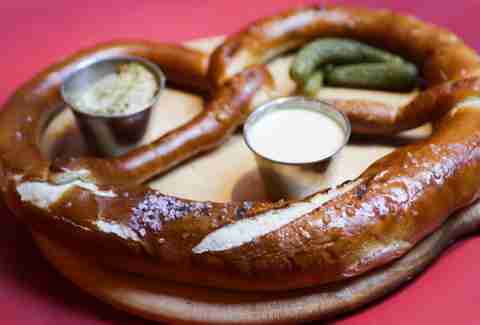 Or maybe, just maybe, it's that regardless of tax bracket, all anyone really wants is a hot pretzel, an inviting crowd, and a giant mug of cold, cold lager. Authenticity is the name of the game at this O-ist-of-G beer hall, owned by a German expat dedicated to bringing the taste of Bavaria to the A. Kick back and enjoy a juicy wurstsplatte, a frosty German import beer -- served in a heavy-bottomed, wide-mouth stein, of course -- and take in the kitschy, ode-to-Deutschland decor (think: pastoral murals straight out of "Hansel and Gretel," long wooden tables, stone walls, a model train choo-chooing overhead). It might be 90 degrees outside, but inside it's as pleasant and cool as the Alps in April. No list of great American beer halls would ever be complete without a nod to New York’s oldest, and arguably finest, lager-guzzling, sausage-scarfing institution. The tap list runs the gamut from Krombacher and Hofbrau to Blue Point and Lagunitas and the menu is loaded with all the Euro comfort dishes you know and love (homemade pierogies, anyone?). The real star of the show, though, is the space itself -- the tree-lined garden is one of the city's largest outdoor drinking spots and for shoebox-dwelling New Yorkers, it doesn't get much better than that. And though the century-old beer mecca is not actually German -- it's owned and managed by a Czech and Slovak community group -- it does throw a mean Oktoberfest party, complete with epic stein-hoisting contests (seriously, look it up), crazy-cheap draft specials, and lots and lots of live polka. This Bowery outpost sets itself apart by brewing all its draft brews tableside, piping it directly from the tanks to your stein. That means every pour is ultra-fresh, a crucial factor when it comes to delicate, subtle German lagers. The bar is long and inviting, the dining room is in full view of the gorgeous, state-of-the-art copper brauhaus, and the food tastes as good as it smells (get the bratwurst burger, stacked with briny sauerkraut and nestled in a pillowy pretzel bun). 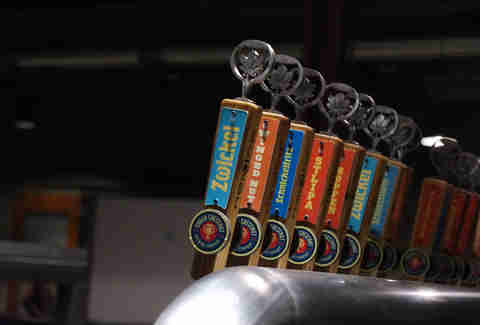 Paulaner is obviously a well-established international operation, but its first American location bucks tradition by incorporating modern-day hops and IPA-influenced brews into the ever-growing repertoire. Who's Resi? Who cares! All we care about are 12+ rotating German taps plus a massive bottle selection focusing on specialty Weiss beers, delicious and super-filling Eastern European standbys like rahmschnitzel and belly-warming beef goulash, floor-to-ceiling vintage decor (think: yellowing coasters, lederhosen-clad bobbleheads, Alps-inspired woodcuts, steins, steins, and more steins), and an adorable stay-all-day back patio. 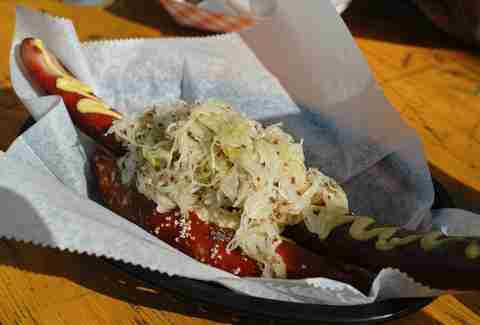 If you're a beer-loving, sausage-craving Chicagoan (i.e., any Chicagoan), you've probably already been there, done that, and are currently sporting the T-shirt to prove it. 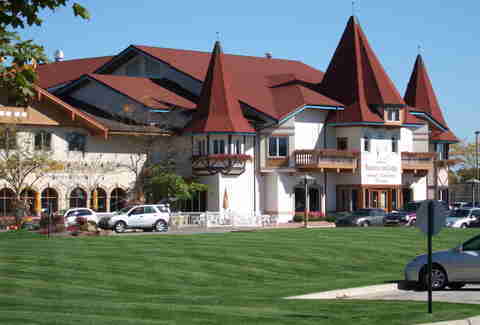 Driving into the village of Leavenworth feels like you've somehow hit a wormhole and gone from the Pacific Northwest into the German countryside, and that's kind of the point: Leavenworth prides itself on being an authentic representation of Alpine livin' slapped into the Pacific Northwest. And no German village is complete without a great bierhall, a mantle Munchen Haus has gamely taken up. This is a place that gets very literal with the concept of the beer garden: an enormous display of vibrant flowers, lovingly manicured by the owners' parents, serves as the border for the raucous outdoor drinking area, where steins swing freely year-round amid gorgeous mountain views from the balcony. The joint also recently started up its own brewery, Icicle, with the solid crosscut Pilsner holding its own with the German offerings rotating on tap. It also makes a great IPA, in case you need reminding that you haven't discovered Germany's answer to Brigadoon. Anheuser-Busch alum and real-life German person Florian Kuplent is the brewmaster behind this 7,000sqft, LEED-certified Forest Park production brewery and beer hall, and boy does he know his Bavarian beer. House brews reflect Urban Chestnut's core "new world meets old world" philosophy -- an expertly crafted mix of IPAs, Belgian-style farmhouse ales, and age-old German standards. The space, a former paper factory, has it all: streamlined, post-industrial vibes, an unobstructed brewhouse view, and schnitzel fried so crispy, served so hot, and piled high with so much tangy 'kraut you'll be breaking out the lederhosen in no time. 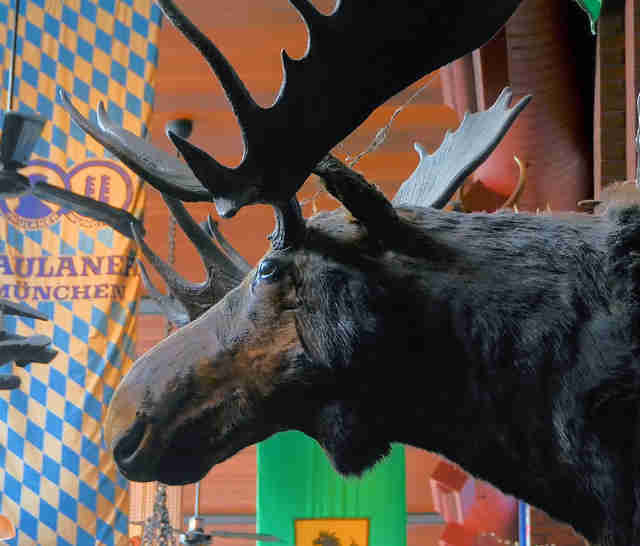 Portland was recently blessed with Zoiglhaus, a 7,500sqft, family-friendly German-themed brewery in the underserved Lents neighborhood that capped off a slight boom in German drinking culture. 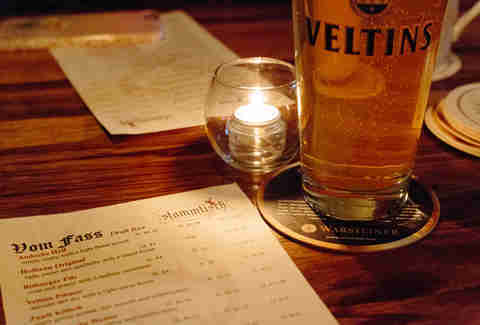 But Stammtisch -- a sister bar to the also-great biergarten Prost -- is the whole shebang. The smell of currywurst hangs thick in the air here, among other farm-fresh takes on German classics (there's also a damn fine burger). Then, of course, there's the beer, served as God intended: by the liter, with a huge selection of German imports poured into proper glassware and best enjoyed as a substitute for doing biceps curls. On rainy days (aka "a day" in Portland), they're best enjoyed boisterously at the thick, authentic wooden tables. But come Oktoberfest, the party spills into the streets. Also as God intended. Philly has always prided itself on its indulgent, greasy eats and laid-back drinking culture, so it's easy to see how this red brick, garage-like year-round outdoor jawn serving up liters of thirst-quenching German drafts and six (!) different types of sausages makes a killing in the city of bruder-ly love. Ice-cold helles lager and Pils keep revelers chilling on sticky summer nights while malty Oktoberfests and smoky schwarzbiers -- not to mention a cluster of space heaters and a real-deal fire pit -- keep 'em going straight through the spring. 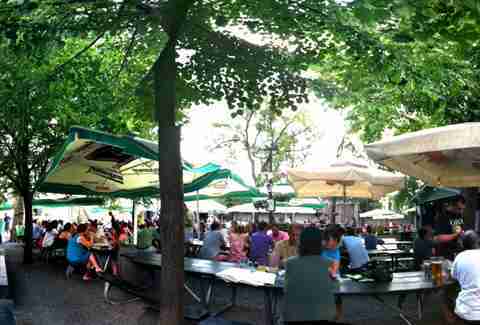 Stake out a spot under a shady tree, grab a seat at one of the many communal picnic tables, and raise a stein to Philly. Perched on the far edge of Milwaukee's Estabrook Park, this serene watering hole might be tough to find, but it's definitely worth the hike. 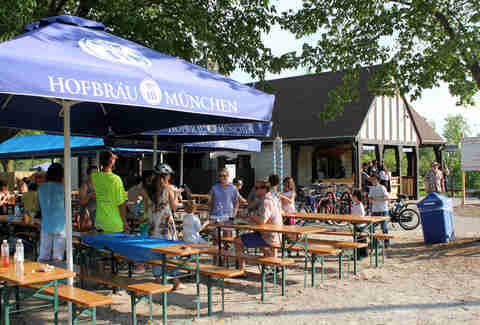 It's arguably the garden-iest of biergartens, littered with long tables, bicycles, and picnicking families taking in beautiful river views, tipping back frothy steins of Hofbrau Munchen, and basking in the midday sun. It's the kind of place where an entire Sunday can pass in what feels like a matter of minutes, so make sure to pack that sunscreen. Back in 1959, Silver Lake was nowhere near the hipster mecca it is today -- meaning it was the perfect place to open one of Los Angeles' most charmingly kitschy biergartens. And through the years, Red Lion has prevailed, hanging fast to its commitment to Disneyland-level European immersion. 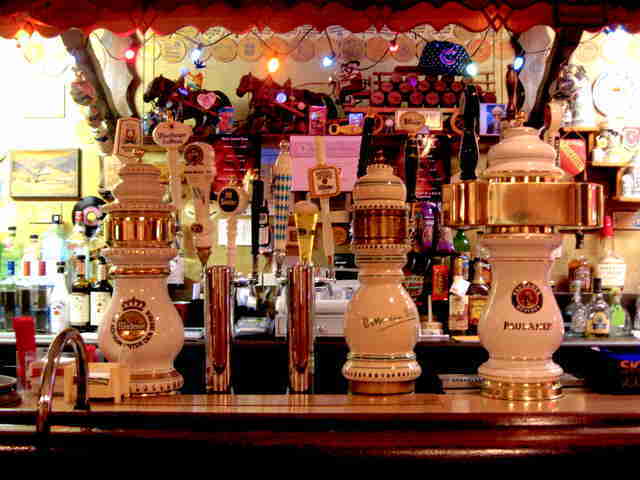 Of course, it's got all the usual suspects: German beer on tap (Warsteiner, Spaten, Bitburger, and more) and a schnitzel-and-wurst-dominated menu, plus a backyard garden so laden with flags and old-school flair you'll swear you've slipped into some sudsy German fairytale. Be sure to peep the rooftop -- it's one of the most laid-back and least pretentious in the 'hood, by far (and totally lacking in skinny jeans and oversized sunglasses). In the market for a nice outdoor beer hall where you and about 100 of your closest drinking buddies can comfortably kick back for an afternoon? The Rathskeller is here for you. This palatial, castle-like bar has everything you want and more -- a central Indianapolis location, a backyard and ornate corner stage fit for a music festival, and heat lamps a'plenty for optimal late-night fun. Inside, you'll find a long, narrow restaurant space, chock-full of taxidermy and eerily reminiscent of Harry Potter's dining hall, as well as with enough space for an entire wedding (if you're feeling frisky). Try to get there early on the weekends, as this can place fill up faster than the Hoosiers can blow a 14-point lead. Meredith Heil is a staff writer for Thrillist. Look, she's the property of Oktober -- she ain't drive here, she got chauffeured. Raise a stein with @mereditto.